People looking to launch their own business for the first time may have trouble knowing where to begin. This is exacerbated by the fact that there are thousands of websites out there with their own set of guidelines or tips on how to successfully launch and maintain a small business, which can overwhelm someone who is just starting out. In reality, there is no panacea or magic bullet that will solve all of your problems, as the business market is always fluctuating. The good news is you won’t find any one size fits all, derivative tips here, as we have found that the best business ideas force a person to think creatively in order to solve problems. So, without further ado, let’s delve into the top four tips for starting a small business that you haven’t heard a thousand times already. Starting any business, even a small one, can be an intimidating and daunting mission. The truth is if anyone could start their own business and be their own boss they would, but the vast majority of people are members of the rat race instead. In reality, there is a myriad of reasons not to start a business, such as the added workload, pressure and responsibilities, not to mention the time and money involved in starting a new business venture. The good news is that worrying about opening a business is perfectly normal, as no one can truly predict whether or not a business will succeed in the short term or long term. The sad truth is making excuses will only hold you back from your potential and from realizing your dreams. Hence, if you are thinking of starting a small business then you need to bring up the reasons why you are wary of starting a new enterprise and then eliminate them, In other words, you need to find a concrete solution to the issue instead of letting your self-doubt hold you back. You should also take the advice and recommendations of all those around into consideration: This will likely include your closest friends and family, but also connoisseurs and even yourself. Figuratively speaking, you need to metamorphosize into a sponge in order to absorb all of the pertinent entrepreneurial advice. Moreover, as you continue to learn and evolve, try and work the ideas out in your head. Then jot them down and use the notes that you’ve compiled from all of the newfound knowledge you’ve absorbed to formulate a solid business plan. Also, try and encourage honesty from the people whose advice you are seeking. Read their body language to determine if they are being sincere or deceptive in their counsel. The truth is their opinions could actually reflect how your prospective clients will actually feel or react to your products or services, so being honest is paramount. You should also particularly pay attention to what seasoned business owners and expert entrepreneurs have to say about your small business idea. They obviously have the business acumen and tenacity to succeed in a cutthroat market, and as they’ve already learned from their mistakes, they can help pass on their knowledge to you. In other words, they already know what will work and what will fail, so why not avoid any mistakes to begin with so you can succeed sooner rather than later? The first thing you need to determine before starting a small business is what your product or service will actually solve. In other words, how to sell your product should come second, as if your product or service does not address a specific market need then it simply won’t sell at all. That is, you should think of your business as a hole filler in a certain market niche. For instance, accounting is something that a lot of startups struggle with. As such, there is a need for accounting software that is user-friendly, affordable and will maximize returns so that the money can be reinvested into the company to help it grow. Hence, creating a user-friendly and affordable software that maximizes ROI may be a good idea, as it is directly addressing the needs of a specific market niche. By understanding the unique needs of your key target demographics you will be able to custom tailor solutions that speak to them; this will allow you to build your client base, who can serve to help diversify your portfolio in the future with new IPs. In sum, the key is to discover the needs of your target customer base and create a pragmatic solution to solve those needs. In other words, simplify. An elaborate idea may seem exciting in concept, but can quickly spitball into a tangible nightmare if not executed properly. As a result, try and keep things nice and simple so that you don’t end up with an expensive, overly complicated mess that will not appeal to any demographic; this is especially true with small businesses, as budgets and resources tend to be limited and competition tends to be tight. Ergo, you should try to narrow your focus and test out your ideas before you launch. Focus on implementing a service or providing a product that is simple yet effective in solving the needs of your key demographic. Any superfluous features or frills should be eliminated to save you money as well as simplify the product or service in question. However, in the event that your company starts to grow, then you may want to slowly add new features in order to keep your customers interested and coming back for more. We hope the tips we’ve provided you with to help you launch your first business have proven informative and fruitful. Remember to do your due diligence, plan ahead and stick to simple yet practical ideas that directly address the specific needs that your key demographics need addressing. 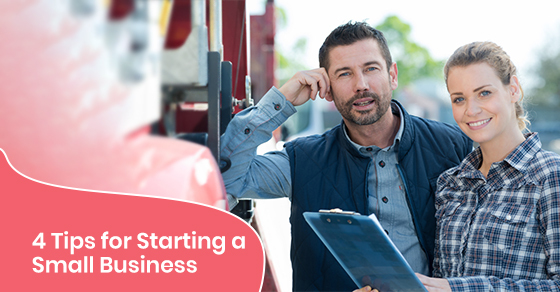 For more helpful tips on starting a small business, call Truck Loan Center at 1-866-230-0094 or contact us here.